Marco Neelsen, Chief Executive Officer of PTP in his statement remarked that the latest digital roadmap is testament to PTP's commitment in providing best in class service for our customers. "Given the pace at which technological advancements are changing the world, it is imperative for PTP to remain competitive and attractive. By investing in the latest technology, we are establishing our terminal as one of the best equipped and most technologically advanced terminal port in the region". 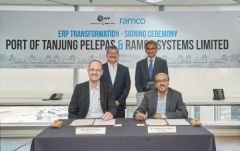 Virender Aggarwal, CEO of Ramco Systems stated "as one of the leading trusted ERP software providers, our main objective is to enable the end-to-end digital transformation for our client organisations. PTP, being one of the world's premier and biggest transhipment ports will expand our expertise while we continue supporting their vision with our technologies and innovations." The Port of Tanjung Pelepas (PTP) is Malaysia's largest container terminal. The port delivers reliable, efficient and advanced services to major shipping lines and box operators, providing shippers in Malaysia and abroad extensive connectivity to the global market. PTP is grouped under MMC Port Holdings Sdn Bhd (MMC Ports), Malaysia's largest integrated logistics service provider. MMC Ports is a wholly-owned subsidiary of MMC Corporation Berhad, a leading utilities and infrastructure group with long standing credential and capabilities in ports & logistics, energy & utilities and engineering. Its terminal operations are backed up by state-of-the-art facilities, equipment and information technology systems linked to all port users. To date, the Port is operating with 14 berths totalling 5.04 km in linear wharf design. The port's container yard is one of the largest container storage facilities in the region with the capacity to handle up to 10.5 million TEU annually. MMC's Engineering division has continued to stamp its presence in its sector with a leading role as the Project Delivery Partner (PDP) and underground works package contractor for the 51 km Klang Valley Mass Rapid Transit (KVMRT) Sungai Buloh-Kajang project (SBK Line) and Sungai Buloh-Serdang-Putrajaya project (SSP Line). Prior to this, MMC has successfully completed the 329 km Ipoh-Padang Besar Electrified Double Tracking Project as well as the innovative Stormwater Management and Road Tunnel (SMART) motorway, the first of-its-kind, dual-purpose tunnel in the world. In other businesses, MMC wholly-owns Aliran Ihsan Resources Berhad, a company which specializes in the full spectrum of water treatment and Senai Airport Terminal Services Sdn Bhd, the operator of Senai International Airport in Johor Bahru - a major aviation hub and the main air transportation gateway to Iskandar Malaysia. The Group Property arm of MMC manages close to 6,000 acres of industrial developments in Iskandar Malaysia, Johor and Kulim, Kedah, namely Senai Airport City, Tanjung Bin Petrochemical & Maritime Industrial Centre (TBPMIC) and Northern Technocity (NTC). The Senai Airport City, TBPMIC and NTC developments come under the ambit of the Group Property's three operating companies - Senai Airport City Sdn Bhd, Seaport Worldwide Sdn Bhd and Northern Technocity Sdn Bhd respectively. Ramco is a next-gen enterprise software player disrupting the market with its multi-tenant cloud and mobile-based enterprise software in HR and Global Payroll, ERP and M&E MRO for Aviation. Part of the USD 1 billion Ramco Group, Ramco Systems focuses on Innovation and Culture to differentiate itself in the marketplace. On Innovation front, Ramco has been focusing on moving towards Active ERP leveraging Artificial Intelligence and Machine Learning by building features such as Talk It - which allows transactions to be carried out by simple voice commands, Bot it - which allows users to complete transaction using natural conversations; Mail It - transact with the application by just sending an email; HUB It - a one screen does it all concept built to address all activities of a user; Thumb It - mobility where the system presents users with option to choose rather than type values and Prompt It - a cognitive ability which will let the system complete the transaction and prompts the user for approval. With 1700+ employees spread across 24 offices, globally, Ramco follows a flat and open culture where employees are encouraged to share knowledge and grow. No Hierarchies, Cabin-less Offices, Respect work and not titles, among others are what makes the team say, Thank God it's Monday!